Nikkatsu had been in turmoil for more than a decade. The studio had lost its production unit in 1942, and the business had been in shambles. Kyuusaku Hori, CEO of the company, tried to rebuild the business by investing in the areas other than movie business such as hotels, real state development, and entertainment management. However, there were lots of people who wanted Nikkatsu to do what it was supposed to do. Making movies. In 1954, Nikkatsu opened its new studio in Chofu, Tokyo and restarted the film production. The studio is still in operation today, even though it is reduced to one-fourth in its size. This film was one of the earliest efforts to put the Japan’s oldest studio back in the map of entertainment industry. “Policeman’s Diary (警察日記, 1955)” is a film of everyday life in rural areas of Northeastern Japan, told in “Grand Hotel” style. The center of the narrative is the police station, where its policemen deal with ‘crimes’ – petty theft, shoplifting, abandoned children, or illegal job recruiting. Through this looking glass, we see the myriad layers of lives of this small village. Poverty, disjointed family, lost hope, unemployment, class inequality and more poverty. 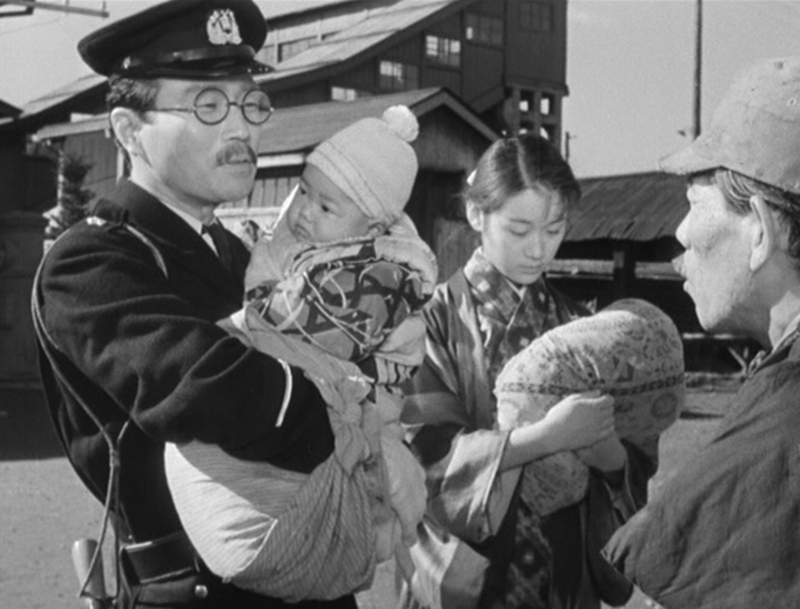 One of the policemen, Yoshii (Hisaya Morishige) deals with abandoned children, trying to find which local office could accommodate such poor kids. Kindergarten? Child welfare center? Orphanage? No. Every office has its own rules and these kids are out of their ‘jurisdiction’. So Yoshii takes one of these kids home and asks his neighbor hotel to take care of another. Another young policeman, Hanazawa (Rentaro Mikuni), meets a girl who was sent off to the factory out of town by an illegal recruiter. The problem is she and her mother need cash and the recruiter hands them cash up front without asking any question. No education? No problem. No experience? Don’t worry. The factory needs you. The girl flatly tells Hanazawa, who tried to persuade her not to take such a shady deal, “the government job office is no good. They ask you a lot of questions but they don’t give us any jobs and any money”. The veteran policeman, Kuramochi, takes the case of the “habitual” shoplifter, Setsu. Kuramochi learns that Setsu with her son were abandoned by her husband and simply there is nowhere else to go, no place to work, and no money at all. She shoplifted a pair of shoes for her son. Kuramochi released her without pressing charges. You will witness one of the most amazing art of acting in this film. Terumi Niki, playing one of the abandoned children, exerts herself to bring the most primitive form of sorrow and she succeeds. Of course, she was only six years old at the time, and she did what she was told to do, but still the energy of the sorrow and resolution afterwards are all the more convincing and moving. Another showcase of the film is, of course, Haruko Sugimura, who played the illegal job recruiter. She does what she does the best: a terrifically funny, savagely profane, and brutally honest woman. The superintendent of the station is a basically good-natured person, if not bright. The Chief Kaneko is diligent, and he is the one who runs the office. And here and there, we see the local politics is at play. The farmers union wants some favor from the Tax Bureau. The congressman from their prefecture is now the Trade Minister and he is visiting this small village. The locals know they need a governmental aid to prosper. Any aid. Their fuss is captured in humorous and slightly patronizing way in the film. You probably fall in love with the pastoral landscape in this film. Gentle silhouette of mountains, fresh breeze running through the field, serene presence of the river. It’s Aizu, the backyard of Kanto, Fukushima. As I watched this film, I started to realize this was the time when Fukushima was actively promoting its land for an energy-harvesting industry. Since 19th century, the Joban Coalfield in the east part of Fukushima was one of the most important coal mines in Kanto area, since it was the nearest coal mine to Tokyo. However, the change in energy policies and economics after WWII demanded drastic change in the local economy. Agriculture was still a big part of their economy but the local politicians needed some industrial revolution. So they actively waged a (rather secret) campaign to build a nuclear power plant in the area where the coal mines used to be. Even though it took more than a decade, Tokyo Electric Power Company finally decided to build its nuclear plant in Hamadori area of Fukushima. Fukushima Daiichi started its operation in 1971. When the disaster struck in 2011, many of us asked why the failed power plant supplying electricity to Tokyo area had been built in such a far-off place, not near Tokyo. It is rather obvious. The plant needs to be as far as possible from the populated area “to avoid a disastrous impact on population in case of an accident”, according to the preliminary research about a location for the proposed nuclear power plant conducted by Toshiba. From the local point of view, such a power plant was considered favorable, because it created jobs and furthermore, the government paid annual ‘kickbacks’ to the area under the name of the “grant”. It was like a drug. Once you enjoyed it, you crave for more. Then, TEPCO built another nuclear power plant next to the Fukushima Daiichi. But such a local politics may need to be placed in the proper context. Why did they need such a gamble in the first place? Fukushima as a whole, not only in Hamadori where the nuclear power plant was built, but also in Nakadori and Aizu, was lagging way behind in economy growth. And such slow growth would hurt the most vulnerable. And we may glimpse the conditions of the most vulnerable in Policeman’s Diary. The original story, on which the film was based, was written by Einosuke Ito, a socialist who had specialized in depicting the conditions of poor farmers. Compare this film with another Nikkatsu film of the era, “Satan’s Town (悪魔の街, 1956)”, a crime caper in the style of film noir, directed by none other than Seijun Suzuki. Not only these two are so dissimilar in styles and sensibility, but also what captured in their frames are vastly different. It is unbelievable that they were from the same country in the same era. Of course both of them are fiction films, but there are bits of truth in them.